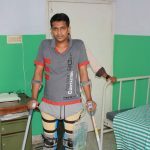 EHCC wish to introduce the tragic case of Albert from Kollam, who was paralyzed from hip downwards, further to a freak accident at his work site. He was treated with Mafraq Hospital. As informed by doctors, it is very difficult for Albert to regain the use of his legs ever again, barring a miracle. Albert came to Abu Dhabi 3 months ago as a technician in a ready-mix plant and company based in Mussafa. He is only 20 years old. For Albert, the prospects back home are not very promising. He is survived by an unemployed and sick parents and a married brother who works as a skilled technician back in Kerala. The cost of any further treatment even back at home is intimidating. So is the likelihood that he’ll remain a cripple for the rest of his life. As he is very new at work, his company is unlikely to pay him anything substantial when he goes home in this condition.